I made this salad for my mom as she eats only salads for lunch now a days. Dressing is very very easy too. If you do not have balsamic vinegar, just use regular lemon juice. Mix all the ingredients in a bowl and serve chilled :). I add my "Suji's" tag to any dish I create based on a traditional recipe. I have to for veggie and grocery shopping this weekend and when I checked my freezer and pantry, I had few things. After debating for 2 minutes as to what to make for dinner, here is what I came up with. I served this gumbo with brown rice. Also, I think I will add some shrimp next time ;). Red Chili Powder - 1.5 tsps. - Heat butter and oil in a skillet or wide bottomed pot. - Add garlic, onions, celery and bell pepper. Season with slat and saute till soft. - Add everything under seasonings and saute for one minute. 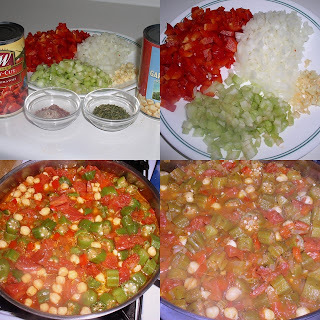 - Add the tomatoes, okra and chickpeas. - Stir the pot or pan without using the spatula. - Add the cup of water, adjust seasonings, cover and cook for 15 minutes on medium-low flame. - Check in between but do not mix too much. - Remove the lid to see okra is cooked. You will notice that okra is not sticky at all (something about canned tomatoes sourness). - Now cook on high for a minute or two till you get a thick consistency. Remove form heat and serve over hot brown rice. Give me any vegetable and I will make a pappu put of it ( basically lentils with veggies). This one is with Dasakai. Not sure what It's called in english but that's what we call it in telugu land. I was surprised t find this vegetable in my local Asian grocery store under Japanese vegetables category with the name "Dose-Kai".Hahaha funny I know. Anywho, my cousins were visiting this weekend and I served this pappu with Goruchikkudu kaya koora, rasam and fried vodiyalu (dried lentil fritters depp fried). Dosakai - 1 medium sized cubed. - If you look at the picture above, you can see that there are seeds in the center of that vegetable. Scrape that off completely and you will get something that's next to it. - Heat oil in a pan. Add mustard, cumin seeds. Once they start to splutter add garlic, curry leaves, green chillies and onions. - Saute for few minutes and add the dosakai. - Add slat and turmeric and 1/4 cup of water. Cover and cook till the veggies are tender. - Add chilli powder and fry for 30 seconds. - Add the cooked lentils to this(you can add any extra water you have left over form cooking the lentils). - Cover and cook on low heat for 5 minutes. - Uncover and cook till you get a thick stew like consistency. 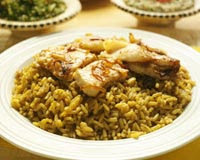 - Turn off stove and serve with hot rice and some melted butter. I found these chillies in my super market the other day and decided to try them. They are super spicy with the seeds inside but once you deseed and take the veins out, they are very good for stuffing. I was debating between a cream cheese filling and others. Decided to go with corn. I used Mccormick's curry powder. As far as I know, none of the Indian curry powders taste that way. use very little of the curry powder as it tends to overwhelm the dish. Curry powder - 1/2 tsp. - Heat oil in a skillet. Saute onions till soft and add corn to this. - Add curry powder and season with slat and pepper to taste. - Remove the mixture from heat and let it come to room temperature. - Spray a baking pan with oil and arrange the chillies. Season them salt and pepper and brush them lightly with little bit oil. - Add the corn and onion mixture to these chillies. It's usually 1 to 2 tablespoons of mixture per chilli. - Bake them for 10 o 15 minutes. Say that title fast 10 times ;). I used whole grain white bread for this, you can even use wheat bread if you like. Mustard Oil - 2 Tsp. - Mix onions, tomatoes, green chillies, salt, pepper and oil in a bowl and keep aside. - Spray cooking oil in a baking pan and arrange the bread pieces. - Scoop little bit of the onion and tomato mixture onto the bread slices. - Bake them in the oven for 8 to 12 minutes or till bread is lightly toasted. - If you are adding cheese, add them few minutes before you take the toast out of even so you get melted cheese and not burnt cheese. - Mix all the ingredients except flour. - Add flour little bit at a time to get the Zucchini batter to a thick consistency. It should be thicker than usual pancake better. - Make patties and pan fry them turning after 20 to 30 seconds on each side. Serve hot with any hot and sour sauce. The picture of these cutlets standing up has been taken with an inspiration from Jai and Bee's Sweet potato Crisps :). Quick Mint Chutney - 1 Tbsp. - Heat Oil in a pan and saute onions till soft. - Add ajwain and quick mint chutney to this. - Add boiled potato cubes and cook for a minute. - Add grated paneer and 1/4 cup of water and cook till everything is well mixed and comes to a creamy consistency. - Let this mixture come to room temperature. 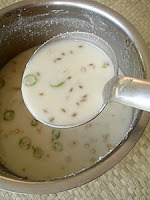 - Add besan to this few teaspoons at a time to get it thick enough so you can fill the chillies. - Mix Besan, Baking Soda, Asafoetida, Garlic Powder, Salt, Turmeric. - Add water little by little to get it into a thick consistency. - In a wide plate spread the 1/4 cup of besan. - Stuff the chillies with the potato and panner mixture. - Coat them with the dry besan. - Dip them in the batter and deep fry them till golden brown. This is what the final outcome looks like. pardon the pictures. I got my new camera and I am still playing with the settings :). I decided to cook a nice meal for the family yesterday (not that I don't everyday). I made Lentil Soup, Salad from Luscious Food and Noodles from Steamy Kitchen. Since our family consists of vegetarians, seafood dis-likers and Shrimp lovers, I made the dishes vegetarian and had sauted spicy shrimp on the side so the rest of us shrimp loving folks could eat it. I wanted to make a simple pasta dish and decided to whip this up with fresh tomatoes. I am not a big fan of the canned tomatoes or the too much red sauce on my pasta. And no I don't use fresh Parsley ever. It gives a weird flavor and I do not like it. Sue me now ;). Fresh Parmesan Cheese - 1/4 cup. Dried Parsley - 1/4 tsp. - Cook the pasta according to package directions with enough salt..
- In a medium pan, heat oil and butter. - Add shallots and garlic and cook for few seconds making sure garlic is not burning. - Add the red bell pepper. Season with salt and pepper. - Once pepper starts to get soft, add tomatoes, cover and cook for 2 minutes till tomatoes start to wilt. - Add cooked pasta to this and mix. - Add milk and stir for 30 seconds. Check for seasonings. - Take the pan off the stove, mix cheese and parsley and serve hot. I have started to go to farmer's market regularly and am finding myself with some good stuff. The bean and potatoes used in this recipe are from the market. Ground Mustard - 2 Tbsp. - Bring 1 quart of water to boil. Salt the water. - Add green beans and cook for 2 to 3 minutes till the beans are cooked just enough. - Remove from water and pat try on kitchen towels. - Add potatoes to the hot water and cook them . DO not over cook so potatoes get all mushy. - Mix all the ingredients for dressing and whisk them or just run it through a food processor. Adjust seasoning. - Mix beans and potatoes in a salad bowl and add the dressing. Before I start the recipe, just wanted to let you guys know that I added links to Rayalaseema and Kadapa on to the left side. Because I will keep using them a lot in my write-ups and I don't wnat you to go, "What the heck is Kadapa?" :). Today I made this curry for lunch. Goruchikkudu is also called as mattikkayalu in Rayalaseema region. I found out that they call it cluster beans in English after I came to this country. In Hindi, It's Guvar. I used to buy them fresh but lately I realized, the frozen variety are much better and they are already pre-cut for you. So here is a recipe that one of my neighborhood aunty use dto make in Kadapa. She used to add dried coconut powder but I did not as mom's on a diet. Putnala Pappu (Dhalia) - 2 Tbsp. Senagapappu (Chana Dal) - 2 Tbsp. - Roast Senagapappu and putnala pappu. - Grind it with green chillies and half the curry leaves. - Heat oil in a pan. Add mustard, cumin seeds,curry leaves and garlic. - Saute for 30 seconds and add onions. - Season with salt and turmeric and saute till onions are soft. - Add the beans and half cup of water. - Cover and cook on medium to low heat till the beans are fully cooked. - Add the ground putnalapappu powder to this and mix well. - Saute till all the water is evaporated and beans are well mixed with the masala. Remove from heat and serve with hot rice and some sambar or pappu. I pressure cooked beaten eggs. If you do not have a pressure cooker you can cook these eggs in frittata style. Garlic powder - 1/4 tsp. - Beat eggs, egg whites with curry powder, garlic powder, slat and pepper, 1 tsp. olive oil till well blended. - Transfer this into a butter coated vessel and pressure cook for about 15 minutes till cooked. - Loosen the edges of the vessel and transfer it into a plate. After cooked it should look something like below. Cut it into bite size pieces and keep aside. - Mean while, cook the pasta according to package instructions with oil and salt. When the pasta is 3/4ths cooked, heat oil in a wide skillet. - Add red chili flakes, onion slices and suate till onions are golden brown. Season them with salt. - Add the steam cooked egg pieces to this and saute for 30 seconds, remove form the pan and keep aside. - Bring the pan back on to the stove and heat the vodka sauce. If the sauce looks too thick add 1/4 cup of pasta cooking water to it. - Add the pasta to the sauce and mix well for a minute or to. - Transfer the pasta into a bowl and add the curried egg on top. The quantity for ingredients below makes 4 sandwiches. Me and my familia are not a big fan of runny eggs. So the nicely cooked eggs and the sandwich. We had it with macaroni salad and pickle on the side. Spicy Mustard - 1 Tbsp. - In a bowl, whisk 4 eggs and the 2 egg whites with slat and pepper. - Make an omelette with the eggs in a wide skillet. You can do individual small ones. I made one big one and cut it into 4 parts. - Mix mayo, mustard and chilli oil. - Toast bread and spread the mayo mixture on one or both sides as you need. - Arrange omelette on one side and lettuce, tomatoes and onions on the other. - cut in triangles and serve. My colleague asked for this recipe last weekend. Since I never made it before, I came up with a recipe of how it should be made and gave it to her. She said it turned out awesome which is always nice to hear. So I decided to make it today and changed couple of things around than the original recipe but here it is. 1. If you do not the instant bisibela bhaath mix - here are the standard ingredients that go into making the powder. - Coriander seeds, cumin seeds, curry leaves, Chana dal (senagapappu/bengal gram), asafoetida, dried red chillies. 2. I bought bisibela bath mix which has tamarind pulp in it. So I did not use tamarind paste. If you buy the powder add a table spoon of tamarind extract to this. 3. I added edamame instead of green peas. 4. The mix I bought was very salty so I used very little salt. You can adjust this mix according to your taste. Oil - 4 tsp. +2 tsp. - Wash and cook lentils with 6 cups of water. If you have a pressure cooker you can use 2 cups of water and cook it for 2 whistles. - Wash and cook rice with 4 cups of water. - In a wide pot, heat oil and butter. Add ground nuts and fry them till they turn pale brown. - Add green chillies and all the vegatbles. - Season with little salt and saute for 2 minutes. - Add 1/4 cup of water, cover and cook till vegetables are tender. - Add the bisibela bath mix. Mix well with veggies. - Add cooked lentils and mix well. - Add cooked rice 1 cup of water and mix well. Make sure the heat is on medium to medium low. - Turn the stove off and serve hot with papadams. I served it with oven baked crinkle fries:). I will post pictures for this later tonight as the battery died while uploading them. Edited to add: I added the picture of the veggies. I do not have any pitcures of the final product because the familia finished it off before I could take a picture of final prodcut. There are 3 different ways that I make lemon rice. - Mother in law's way with roasted ground fenugreek, mustard and cumin seeds. Yesterday I did the easy way. Here is a picture of the ingredients. Senaga Pappu ( Chana dal) - 2 Tsp. Minapappu (Urad Dal) - 2tsp. Cumin Seeds - 2 Tsp. - Cook rice with 4 cups of water and keep aside. - Heat oil in a wide skillet. Add mustard, cumin seeds and asafoetida. - Add senagapappu, minapappu, dried red chillies, curry leaves and pea nuts. - Saute them for few minutes. Once the lentils start to turn golden brown, Add green chillies, ginger and salt. - Cook for 30 seconds. Add lemon juice and turmeric. - Turn the flame to low and mix the cooked rice to this mixture. Adjust seasonings. In Kadapa, they would always serve this rice with a dryish wet potato curry. Since the family is on all sorts of diet, we rarely cook potatoes. I did serve with some dondakaya fry. Recipe for it later :). I am not going to go into the difference between biriyani, pulao and all. I know you can easily look it up on wiki or even "google" it. 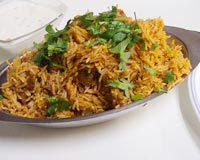 So I am just going to give you my recipe of what and How I make biriyani. Most of the dry spices can be bought in regular stores or you can even look them up in your ethnic food stores. Depending on how mushy your rice becomes use either 6 or 8 cups of water for 4 cups of rice. Since I used sona masori rice instead of basmati, and the brand I used takes lot of water I used 8 cups. However I usually follow 1.5 cups of water per 1 cup of rice. Lemon Juice – 4 Tsps. Garam Masla – 2 Tsp. - Wash rice and soak it in water. - Mince curry leaves, mint and green chillies together. - Heat butter and oil in a pan. Add all the dry masala. Fry for 30 seconds on medium flame making sure they don’t burn. - Add curry leaves, mint and chilli mixture to this. Stir and fry for 20 seconds. - Add onions and ginger garlic paste. - Season with just enough salt for onions and cook till onions are soft. - Add mixed vegetables to this. Season with salt. Cover and cook till vegetables are tender. - Add garam masala, red chilli powder and sauté till the raw smell of hcilli powder is gone. - Add tomatoes and lemon juice. Cover and cook till tomatoes are soft. 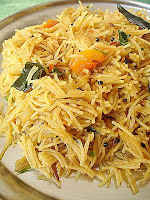 - Remove rice from water and add it to the cooked masala mixture. Stir till the rice grains are mixed with masala. - Add 8 cups of water to this. Season with salt. Water should be a bit salty. - Cover and turn the heat to high and bring it to a boil. - Turn the flame to low and cook till rice is done. To check if you stick a spoon it should come out dry. 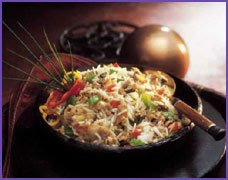 - Add 8 cups of water and rice together to the masala mixture instead of frying the rice first. - Follow the rest of the steps as above. Super simple fried rice :). Chili oil - 1 tsp. Sesame Oil - 1 tsp. Vegetable Oil - 3 Tsp. Soy Sauce - 3 Tbsp. + 3 Tbsp. - Mix 3 Tbsp. soy sauce to the white rice and keep it in the refrigerator. - Heat chili, soy and vegetable oils in a wok. - Add ginger, garlic and onions and saute till fragrant. - Add the vegetables and stir for 3 minutes. - Season with slat and pepper and add 3 Tbsp. soy sauce. - Add the cooked rice to this mixture and stir till you can see the grain separate. - Heat oil in a wok. Add mustard and cumin seeds. - Once they start to sputter, add green chillies, onions and pepper and saute till soft. - Season with salt and add cut bread pieces to this mixture. - Turn the flame to medium-low to low and cook the bread to make sure it forms a crust all around with the help of the heat from the wok. - Prabu says the key is to stir in between making sure it gets an even crust. Again, super easy. For me everything is easy. If not I try to make it easy :). The key to this dish is not to mess with it too much by stirring and mixing and things;). Check the picture below to see how I cut the potatoes. I will try to come up with a better picture next time. I cut them into thin pieces. - Heat oil in a wide pan (preferably non-stick). Add potatoes. - Season with salt, turmeric and mix well. - Turn the flame to medium to medium low and let it do it's thing. - When potatoes are 3/4 cooked, add cumin seeds and garlic powder. Mix once. - Once potatoes are completely cooked through, add chilli powder. Saute till the raw chilli smell is gone. Remove from heat and serve. To go with the Aloo Parathas, I made my quick mint chutney and daal (lentils). At the end we called it "Daal Sowjanya". Why? Here's how it went down. Prabu: Wow, it's so yummy, what is this daal. Me: I think I wanted to do Butter Daal but this has only tsp of butter. Prabu: I think this might be that daal maharani I had few years ago. Me:No maharani business. I will just call it "Daal Sowjanya". Prabu: Well, you are the maharani. Me: Thanks, I know though ;). 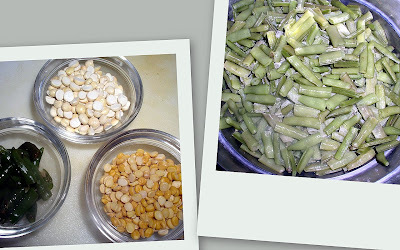 I used green whole beans ( Mung beans or pesalu in telugu). Since i came up with this recipe 30 minutes before dinner time, I didn't soak the beans long enough. So i pressure cooked it for 6 whistles. If you plan ahead, soak the beans over night. Then they cook much faster :). Amchoor Powder - 1 tsp. - Saute onions till soft. - Add salt, turmeric, black salt, amchoor powder, chilli powder and garam masala. - Saute for 30 seconds. Add tomatoes. - Cook till tomatoes are soft. - Add the beans and peas and 2 cups of water. - Pressure cook till beans are soft. - Check for salt and seasoning. - Bring the beans back tot he flame and add tsp. of butter and yogurt. Mix well. It should be of a thick soup consistency and not liquidy. My cousin Vittal called me couple of weeks ago asking for this recipe because my nephew wanted it for dinner :). I gave him the recipe on the phone and I thought I would share it here. These are like Indian version of Ramen Noodles. They recently came up with whole what noodles with sambar tastemaker. I tried that variety today and boy was it good. You can use frozen mixed vegetables if you want but I used fresh ones today. I used a big carrot but use small or medium. Heat oil in a wide skillet . Add cumin, garlic and red chili powder. Add onions, and all other vegetables. Season with salt. Cover and cook on medium-low flame for 5 - 8 minutes till the veggies are soft. Once the vegetables are cooked, add the noodles to this mixture. Mix well so that noodles and veggies are blended in. - For the dressing: Warm all ingredients in pan over low heat until sugar is melted, stirring occasionally and cool. - To make salad: Cook noodles according to package instructions. Drain and chill. Cook carrots for 30 seconds in pot of boiling water. Transfer to colander and rinse under cool water. Add to the noodles. - Toss the noodle mixture with rest of the ingredients. Drizzle with the dressing and top it with coriander and serve. I know it was a weird combo to have for dinner but it was gooood and it was so easy to make. - Mix food color, masala , lemon juice and salt to the curd. - In a ziplock bag, add the chicken and the marinade and mix well till all the chicken pieces are coated. - Leave the ziplock in the fridge for 2 to 4 hours. - Now, you can cook this in different ways, you can either bake them or pan fry them or do what I did. - Pressure cook the chicken for 2 whistles (no need to add any water). - Heat oil in a saute pan. Add the cooked chicken pieces and pan fry them till they form a thin golden crust on all sides. - Do it in batches so you don't over crowd the pan. Rice-A-Roni is nothing but rice and vermicelli cooked together. Instead of Vermicelli I used angel hair pasta. I have a microwave rice cooker, so I just added all the ingredients and cooked them for 200 minute sin the microwave. However you can use the electric cooker or even do stove-top method too. YouChoy I think is also called Chinese broccoli. You can get this in any asian store. I became a fan of it few years ago when my then manager introduced me to this vegetable. Low-Sodium Soy Sauce - 2 Tbsp. - Heat oil in a wok. - Add garlic and stir for 15 seconds making sure it doesn't burn. - cover and cook till the veggie is cooked through. There are a gazillion ways to make chicken curry. None of them involve curry powder event hough it's called a curry. You can play with your spices with these curries. Here is my try for today. This is a little gravyish curry. You can have it with roti or hot rice. The red chili powder I use is very very spicy. You can adjust the quantity depending on your taste palate :). Ginger and garlic paste - 1 tsp. Turmeric - 1/2 + 1/2 Tsp. Red chili Powder - 2 tsp. - Marinate chicken in above spices. Cover and refrigerate for at least one hour. Mean while, get your other ingredients ready. Heat oil in a thick bottomed dish. Saute onions till golden brown with little salt. Add red chili powder and turmeric and saute for 30 seconds. Add tomatoes, chicken, the ground coconut paste and mix well. Add1/3 cup of water. Cover and cook on medium flame till chicken is tender. Remove the lid, season with enough salt and cook till you get a thick gravy. Turn of the stove and serve hot. I used a pressure cooker because meat comes out much tender when cooked in it. You could cover and let it cook for 1 whistle. 1. Heat the Ghee in a pan and roast the cashews for about 1min. Remove and set aside. 2. In the same Ghee fry Vermicelli/Semya and roast until they start turning brown. 3. In a Milk Pan, heat the milk. When the milk starts to boil add the roasted vermicelli. 4. Cook for 4-5min or until the vermicelli is soft and well cooked. The mixture starts thickening. 5. Add the Cardamom powder and mix well. 6. Turn off the heat and add the powdered sugar. Mix well until the sugar dissolves. 7.Garnish with roasted nuts and raisin. 1 Wash the rice and dal and soak them together in water for 15-20 mts. 2 Meanwhile in a heavy bottomed vessel or pot, heat ghee. Add the cumin seeds, let them splutter and turn slightly brown. Add the curry leaves and black pepper corns and fry for a few seconds. 3 Add the drained rice and dal and combine with spices and fry for a few seconds. 4 Add water and salt and pressure cook till the rice and dal are cooked and soft. 5 Garnish with fried cashwenuts and serve with tomato chutney or avakai. Boil rice till each grain is separate and almost cooked. Drain and keep it to cool in a plate. Heat oil in a pan and put vegetables, except spring onions. Stir fry till it becomes crispy, put spring onions, salt and sauces. Mix properly and pour over the rice. Combine the rice and vegetables gently, till evenly coated. Before serving, heat properly either in oven or in microwave. • Grind ginger, garlic, green chilies, turmeric, and salt into a fine paste. • And marinate the fish with it. • In a pan put 1 tsp oil and fry the rice for 2-3 min. • Then add the tomato puree, coconut milk and 1-1/2 cups of water. • Add salt, chili powder, garam masala and mix it very well. • Cover the pan with a lid. • Partially cook the rice (80%) on a slow flame. • In a pan put 1 tsp oil and sauté the onions to golden color. • Do not to break the fish pieces when stirring. • Take a baking dish, layer the rice then arrange the fish with its gravy and then again layer of rice. • Add the milk so that the rice doesn't dry. • Cover with aluminum foil and keep it in the preheated oven for 7 min. • Fish Biryani is ready. • Clean the meat and cut into pieces. • Soak the meat in curd. • Roast cardamom, cinnamon, peppercorns and powder cloves. Make powder. • Grind ginger, red chillies, green chillies, half the onions, garlic and copra. • Now heat fat in a pan. Add chopped onions and ground spices. • Fry until onions turn golden brown. • Now add meat and fry well. Add poppy seed powder. • Add salt and remaining curd. Cook till meat becomes tender. • Add powdered spices to it and remove from the flame. • Chop remaining onions. Fry them in fat in a separate pan. • Add cloves and bay leaf. • Fry for few minutes and add rice. Fry for another few minutes. • Put salt to taste and make the quantity of water double. • Remove from the flame when rice gets cooked and no moisture is left. • Arrange a part of cooked rice in a pan and sprinkle saffron water over it. • Place the meat over it and cover with rice layer once again. • Garnish with fried onions and nuts. • Mutton Biryani is ready. Combine all the above ingredients except oil and let the rava dosa batter sit for half an hour to an hour. It might thicken after a while as rava absorbs the water. 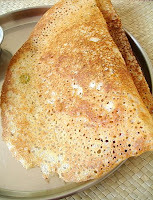 At the time of making dosas add more water such that it is of pouring consistency (like thick buttermilk). Pre-heat an iron tawa on high for a minute. Do the water test (sprinkle few drops of water over the hot tawa such that it sizzles) and reduce heat. 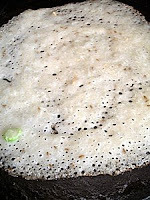 Pour a ladle full of dosa batter from the outward base of the tawa in a circular motion (as shown in the picture below). Fill the gap in the middle with dosa batter. Don’t drop batter like a thick lump but pour all over, evenly, filling the gaps. Pour 1-2 tsps of oil like drops along the edge of the dosa and the gaps in the middle. Increase heat to medium flame and let the dosa cook for around 3 mts. At this point increase flame to high and let the dosa roast for a half a minute or so. If you want a slightly softer dosa, remove the dosa at this point. But for a crisper dosa, let the dosa roast further on high for another one mt or till it reaches a nice golden brown stage like shown in the image below. Serve hot with chutney or sambar. It takes practice to prepare rava dosas. You need to keep in mind a few things while making dosas. 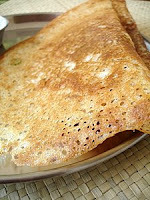 ~ Prepare the batter at least an hour or half an hour before you actually want to eat the dosas. ~ There is no need of fermentation for ravva dosa batter unlike masala dosa batter. Its instant. ~ The batter should not be thick but of pouring consistency like a thick buttermilk consistency. ~ Letting the batter sit in the refrigerator for a few hours also helps in attaining crisp dosas not that you cannot prepare crisp dosas with batter sitting for just an hour. Infact the dosas you see in this post were prepared from dosa batter that was mixed just an hour before preparation. ~ Infact the most important factor in the making of ravva dosa is adjusting the heat control. An iron tawa requires higher heat as compared to non-stick pan. I have used an iron tawa and so adjust heat according to the pan you use to prepare dosas. You need to be around the stove while preparing these dosas. 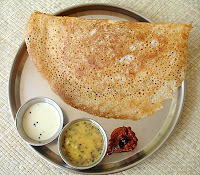 ~ There are many variations in preparing rava dosa. You could add grated carrot and coconut to the batter along with rest of ingredients. Or add some sliced onions while the dosa is cooking. Broken cashewnut pieces can also be added to the dosa batter. ~ At the time of preparing rava dosa, use the ladle to stir the dosa batter well, as the flours tend to sink to the bottom of the vessel like a thick residue. So combine well each time you pour the dosa batter over the tawa. ~ You can flip the dosa and cook the other side as well but I don’t usually flip the dosa. I let it cook on one side only. ~ A cast-iron tawa is best or a non-stick pan (used exclusively for dosas) can be used to prepare rawa dosas. ~ The batter can be stored in the refrigerator for 2-3 days after which it will turn sour (i.e the dosas prepared from batter more than 3-4 days old). 1 Boil 4 cups of water and add the vermicilli along with 1/4 tsp salt and 1 tsp oil. Once the vermicelli is cooked (it should be just soft and not mushy), turn off heat, pour the vermicilli into a colander to drain completely and pour cold water over it and keep aside. 1 Heat oil in a cooking vessel, add the mustard seeds and let them splutter. Add the black gram and curry leaves and saute them till the dal turn slightly brown and a nice aroma emanates the kitchen. 3 Add the chopped tomatoes and saute on medium heat for 4 mts. Add salt to taste (remember you have already added salt to the boiling vermicilli, so add accordingly). 4 Now, add the cooked semiya to the sauteed onion-tomato base and mix it lightly and see that no lumps form and it combines well. Add a tsp of ghee or butter and combine well. Garnish with coriander leaves. 5 Serve hot with chutney or pickle of your choice. For variation, garnish with grated coconut and add 1″ cinnamom stick (during seasoning). You can added roasted cashews too.